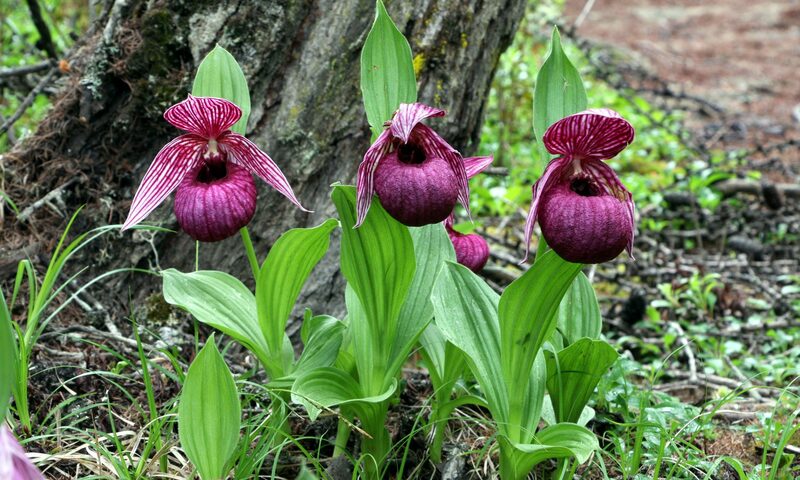 Like other saprophytic orchids, it defies normal cultivation due to its dependency on specific soil conditions. All orchids start their lives dependent on specific soil fungi for sustenance, but this species continues that relationship throughout its life. The orchid’s roots are in direct connection with the fungi which in turn are either using dead organic matter in the soil as a nutrient source or the roots of other plants. Hence, saprophytic orchids are now considered to be ecto (outside) parasites (living off another organism’s energy directly). 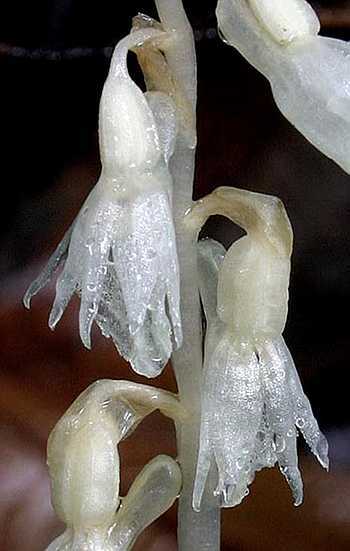 The orchid lives off the fungus, and the fungus lives off dead organic matter or living plant tissues (commonly roots). 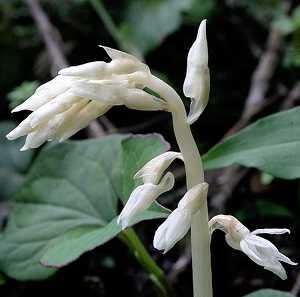 Yagame, et.al (2007) reports success in growing this species along with its fungal symbiont in vitro. In this study protocorms formed stolons and these in turn gave rise to tubers. The tubers then produced flower stalks. Now that’s interesting! 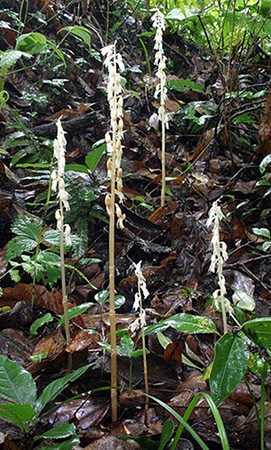 This certainly is a curious terrestrial orchid, but not one most people are likely to encounter personally. I feel lucky to have seen them myself, having only stumbled upon that one colony. I’ve gone back in subsequent years, but haven’t seen them again. It seems that they can spend many years underground waiting for the perfect conditions to flower and set seed. A group of plants in flower. You can see some of the lowest flowers are already setting seed. The flowers of Epipogium roseum show little rose color, however the tiny lip has a few purple spots on close examination.